Lapland is the ultimate Christmas wonderland. From reindeer sleigh rides and ice skating on real solid ice lakes to meet the very man himself who makes Christmas possible – Santa Claus! The Lapland Christmas Resort in Finland is a child’s (and big kids!) dream come true. If a holiday here doesn’t get you in the festive spirit I’m not sure what will. Everywhere you look snow dusted Christmas card scenes fill your vision, with cosy log cabins, grazing reindeers, open lit wood fires and the smell of cinnamon and cloves whirling all around you – Lapland is Christmas in one place. Below we have a list of fun and exciting suggestions of things to do for both the children and grown-ups, so you both get the best out of your special family get-a-way to Lapland. Ever wanted to meet a snow fox? Or how about catching a glimpse of a pack of Finnish wolves in their natural habitat? Well now you can, hold on as you’re whisked through the winter wilderness of Lapland on a luxury family sized snowmobile. Keep a eye out for the abundance of wildlife that call this icy volatile environment their home! Meet and greet with Santa! Ever wanted to meet the man himself? Here is your once in a lifetime opportunity to having a special meeting with the actual Santa Claus. He’s a very busy man, especially around the festive period so doesn’t take up too much of his time. But he will be free for a chat and a glass of milk for you all to say “Hello!” to him. What better way than to get into the festive spirit than a sleigh ride pulled along by all of Santa’s reindeer? There will be all your favorites including the famous Rudolph with his red nose to lead your way. 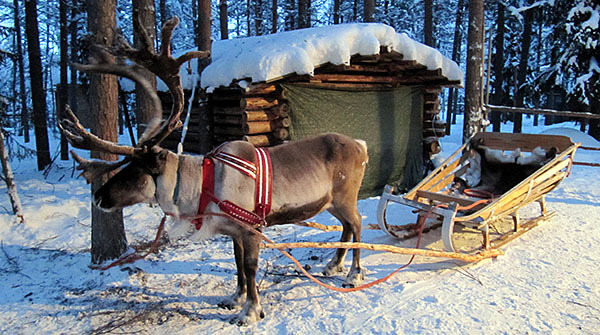 Sit back as you are taken on a magical sleigh ride through the amazing snowy woods of Lapland. The Northern Lights are a natural wonder that will amaze the children and adults alike! Lapland’s location in Finland give you a great vantage point to witness one of nature’s most awe-inspiring spectacles, with solar flares creating shimmering green and pink shifts of light all over the night sky. If you want a real Christmas family adventure book a trip to Finland’s Lapland for the ultimate festive experience. With many resorts offering deals such as ‘kids Go Free’ (with 2 or more adults paying full admission price) and ‘Two for One’ discounts, you won’t be breaking the bank either. Give your family the best Christmas present ever with an amazing trip to the most Christmassy place in the world – Lapland! Last updated by jack on 15 May, 2016 in Destinations.